In large scale organizational change programs I often meet managers who are puzzled by the fact that people don’t learn the seemingly simple things that they are trying to distribute. As they say: “we are spoon feeding the people over here, and still they don’t get it”. In this article I present three different angles that will clarify why their stakeholders “don’t’ get it”. The answer is too simple to be true, maybe that’s the reason it’s so difficult for these program managers to “get it” in their turn. If you were to write down the learning breakthroughs in your own life, what would they be? If you were to map them on a scale of « in isolation – through interaction », where would you put them? The participants actually write their learning breakthrough down on a post-it note and paste it on the pyramid. the result is always the same: the bottom of the pyramid full of post its and the top of the pyramid is always still visible at the end of the exercise. The Learning Pyramid illustrates how much of each level of learning we remember later on. 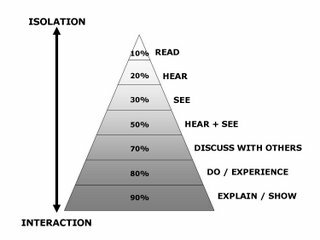 The percentages are illustrative but the trend gets confirmed each time I run this exercise: we remember 10% of what we read, 20% of what we hear, 30% of what we see and 80% of what we do. The pyramid illustrates what is meant by the saying: ‘what I hear I forget, what I see I remember, what I do I understand’. 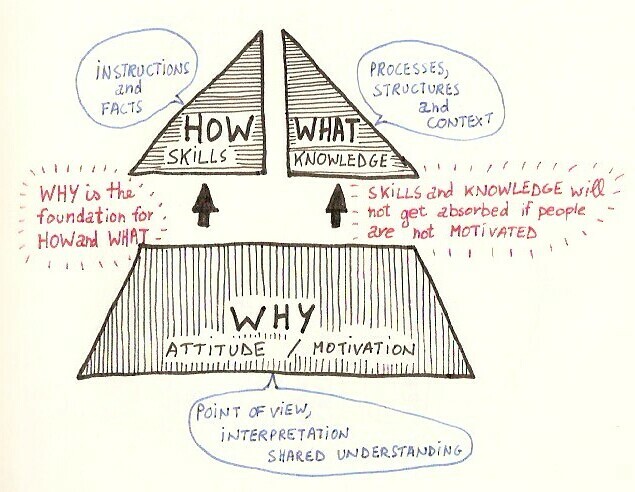 This learning pyramid also illustrates the point of John Seely Brown when he says that it is very easy for us to think that all knowledge is in the head, but we often ignore how much of our knowledge exists in action, participation with the world, participation with the problem and participation with other people, i.e., practices. A lot of the knowing comes into being through the practices of the people and the environment you’re working in. At the top of the pyramid you will find all the information contained in instructions, procedures and manuals. This is the knowledge transfer, which garners the most tangible investments. But the bottom part of the pyramid is much more important: the knowledge as it lives within the organization. This knowledge cannot be classified in an orderly manner; rather it’s a bricolage (*) of all the formal knowledge featuring real issues, possible solutions, actions, war stories and your colleagues’ experience. A manual or a procedure will not help you figure out whether a problem is important, or whether a solution is elegant, or whether it is even a solution. 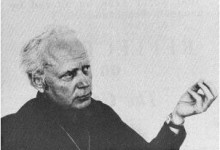 According to John Seely Brown, real knowledge is not taught, it is experienced in the form of unwritten stories and conversation. If you’re not present when the experience is created, you will not create knowledge. A perfect educational project, which is documented with the best manuals and e-learning is still not a guarantee for successful organizational change. 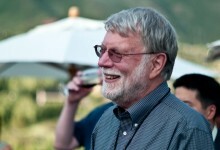 John Seely Brown’s second conclusion is that there is no such thing as an expert. It is wrong to express intelligence in terms of IQ because in reality intelligence is the social skill to work together in a network of experts. Joseph Chilton Pearce defines intelligence as the ability to interact. Now that’s something different! Every organizational change always has the same three ingredients : Motivation (the emotional stuff below the surface), Knowledge and Skills. These determine the domains of action for making the change happen. They are the biggest needs during every cycle of change. Questions and reactions, which fall into the ‘Knowledge’ category, often indicate a need for vision, a business case or an overview. These refer to the ‘what’ of the change. The ‘Skills’ category indicates a need for concrete and explicit knowledge, tools and working instructions. In other words: people want to know ‘how’ they will make the change happen. In addition there is also an entire range of reactions that fall into the ‘Motivation’ category (the underlying reason that drives the change: the ‘why’). These reactions reflect people’s need for involvement and inspiration. The ingredient ‘Motivation’ determines whether people undergo the change or are part of it. An often made mistake in organizational change projects consists of postponing all contacts with the target group until the very last minute. In an earlier post I called this ‘Project Cocooning‘. Too much influence from the target group often has a delaying and disturbing impact. ‘Now we really need to provide information’, is the usual statement. Your team isolates itself from the rest of the company and the communications department fires unidirectional communication (Knowledge) at the target group. As a result, people feel as if a concept is being forced upon them and they aren’t really given the time to fully comprehend it. The knowledge provided during training is so theoretical that it has nothing in common with practice. Many of the people wonder why they have to spend all that time in training and are annoyed because their day-to-day work is just laying around. 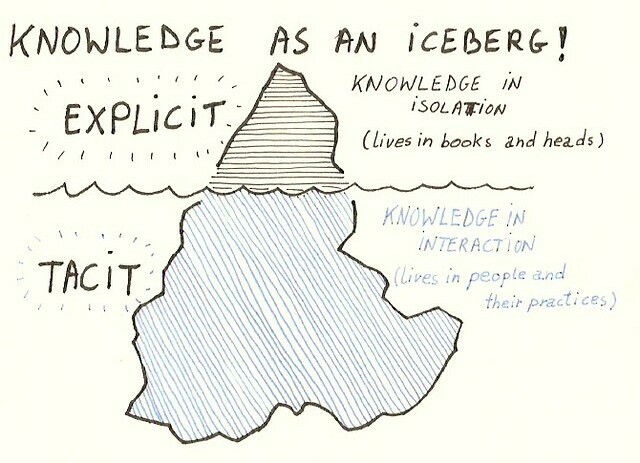 They have received all the explicit knowledge that is – rationally speaking – necessary to face the change. They have had the Know-whats pushed down their throats. But the project grinds to a halt in the production phase because people have not been given the time to participate and build up Know-how. As a law of nature, you will be confronted with a performance drop anyhow. Postponing participation to the very last minute will only make it worse. Even before the change really has started, you are stuck in a negative, downward spiral because most target groups are not being motivated to take the project in hand. When reactions indicate that there is a need for involvement, an information session or training will have the wrong effect. It’s important to know where the needs lie at what precise moment. The best way to find out is to involve the target group in the project in a timely manner. A change is always a discomfort, and discomforts are easier to deal with when you participate in making it happen. The inevitable truth is that people will need to build the Know-how anyway in order for the project to work, so it is better to do that during project preparation than to pay for it in terms of a sputtering go-live. People should be given the opportunity to be part of the creative process that is expected from them. That is why it’s necessary to effectively involve them before, during and after the change. Involve them – too simple to be true – and apparently too hard to commit to. (*) When using the word ‘bricolage’ we refer to an observation of anthropologist Claude Lévi-Strauss. He established that people don’t use an algorithmic and logic approach in their thought process but that our mind works according to the principle of ‘pick and mix’. A ‘bricoleur’ uses concrete, used materials to create something new.